Right now, 1.1 billion people on the planet don’t have access to safe, clean drinking water. That’s one in six of us. 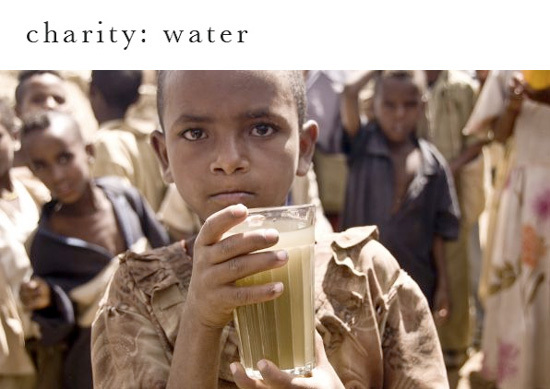 charity: water is a non profit organization bringing clean, safe drinking water to people in developing nations. We give 100% of the money raised to direct project costs, funding sustainable clean water solutions in areas of greatest need. Just $20 can give one person in a developing nation clean water for 20 years. We’ve signed up for fundraising information on building a well ($5k) and when the tool is live, we’ll be all over it. In the meantime, help where you can — make a donation.